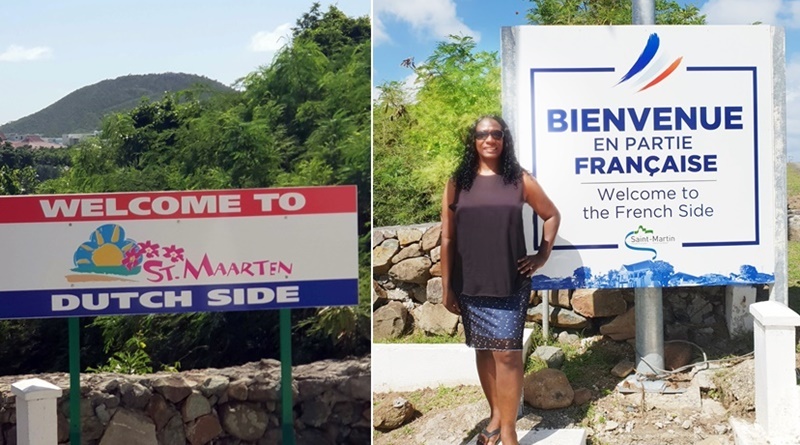 On the penultimate day of our cruise Jen, Rosiepoos and I descended on Saint Martin (French side) and St Maarten (Dutch side), a small Caribbean island that has dual governance from both European nations as a result of a treaty between the two countries in 1648. 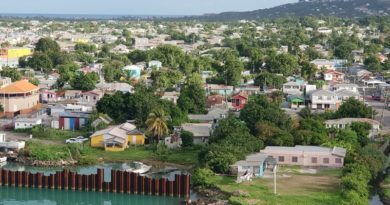 The Britannia was one of six cruise liners to arrive in the capital of Philipsburg, meaning that the port, town and most local attractions were busy and congested. On a blistering hot day, our main interest was in spending some time on the beach. After securing an air-conditioned bus outside the main area with a French, female driver (pictured below) we headed off on a two-and-a-half-hour tour. 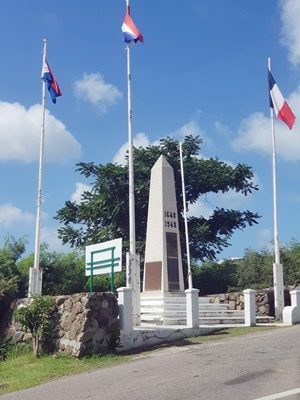 We started on the Dutch side of the island, driving through Simpson Bay and Cole Bay, before stopping at the point where one side of a monument to the treaty marks the Dutch side and the other the French side (pictured below). Once on the French side, we headed for a local shopping centre and spent some time browsing round a trendy boutique. 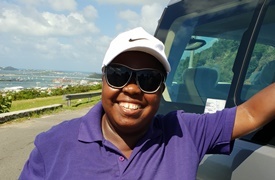 Our driver, who is French, was of the opinion that the French government do more for the people of the island than the Dutch, suggesting that prices are cheaper on the French side and the food tastier (though she could be biased, of course). We decided to test this theory by visiting a local food market, where there was certainly a lot on offer. Rosiepoos and I each bought a large container of various dishes including rice and peas, coleslaw, plantain, sweet potato, lasagne and jerk chicken. They also made a fresh juice which included carrots, kale and ginger. From there we avoided the busy Sunset Beach in Simpson Bay and instead went to the larger and more tranquil Kim Sha beach, where we practically had the far corner to ourselves. As I took out some cash to pay for the sun lounger a one-dollar note flew out of my hand and after chasing it through the sand, it blew into the sea, much to the amusement of my sisters. The sea was lovely and warm and we had a great time in our quiet corner of the beach, before it was time to return to our bus, for the ride back to the ship. On the way we picked up a German couple from one of the other cruise ships who were travelling with their 20-something daughter on her first cruise, who acted as translator enabling us to share amusing stories about our cruise experiences. Once back on board the Britannia there was just enough time for a quick shower before heading to the pool area to participate in a lively Sail Away courtesy of Steele. The cruise ship alongside us, the Royal Caribbean Azure of the Seas was a beautiful sight to behold, lit up like a Christmas tree and we swayed and waved to the beat of the music as the Britannia slowly pulled away.